Crankshaft locking pin – No.KM-952. Slowly turn crankshaft clockwise until locking pin can be inserted in crankshaft  . Tool No.KM-952. Insert locking tool in rear of camshafts  . Tool No.KM-953. Install camshaft position (CMP) sensor disc setting tool  . Tool No.KM-954. 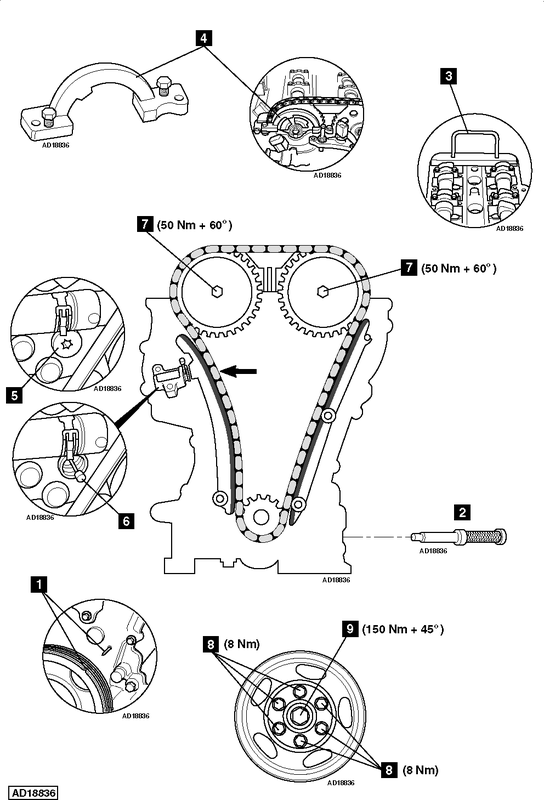 Compress timing chain tensioner and lock with tool  . Tool No.KM-955-1. Fit new bolts to camshaft sprockets  . Stage 1 – 10 Nm. Stage 2 – 50 Nm + 60°. Fit new crankshaft pulley centre bolt. Tighten crankshaft pulley centre bolt  . Tightening torque: 150 Nm + 45°.